"Because the Fed is raising rates too fast and it's independent so I don't speak to him but I'm not happy with what he's doing because it's going too fast. Because you look at the last inflation numbers, they're very low," Trump said in an interview with Fox Business. 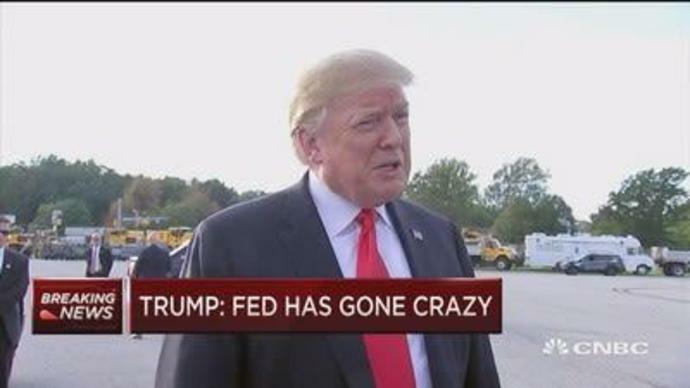 Trump has repeatedly attacked the Fed, saying the central bank has "gone crazy," blaming Chairman Jerome Powell for last week's massive drop in stocks and declaring he was "not happy" with Powell's "loco" decision to continue raising interest rates. Although Trump has repeatedly said he believes the Fed is "making a mistake" with its monetary policy, he has said he is "not going to fire" Powell. Trump said in an Oct. 11 interview that he is "just disappointed" with Powell's decisions.